Tours of the McFaddin-Ward House are led by trained docents and are offered at specific times, shown below. Self-guided tours of the carriage house and the grounds are available between 10 a.m. and 3:30 p.m. Reservations are strongly recommended for the docent-guided tour of the house. Children must be at least eight years of age to take the guided tour. Tours are subject to availability, so make your reservation today! Please call (409) 832-2134 for more information. 10 a.m., 11 a.m., 1:30 p.m., 2:30 p.m.
Tours are available for ages eight and up. Tours are limited to groups no larger than eight, unless arranged in advance. Eating, drinking, cell phone use, and smoking are not permitted. Low, broad-heeled shoes are recommended to negotiate stairs. Spiked heels are not permitted in the museum as they damage the original flooring and rugs. Photography is not permitted in the museum. Though walk-ins are welcome, the museum cannot guarantee entry to guests without a reservation. Purses, bags, and other items may not be carried into the museum. The museum offers complimentary lockers in the visitor center for belongings. Highly trained docents lead all of our tours inside the home. To provide a more personal experience, a maximum of eight people are allowed per group unless special arrangements are made. Combining McFaddin family and local history, our guides tell the story of the prominent family that lived in the home for seventy-five years. Tours last approximately one and one-half hours and cost $5 per person. Self-guided tours of the carriage house and gardens are free, but visitors must check in at the visitor center, located at 1906 Calder Avenue. Large group tours are welcome, but must be scheduled at least six weeks in advance. The museum can accommodate up to 40 people and costs $5 per person. Depending on the size of the group, tours may be available for the first or second floors only. To make a reservation, find out more information, and obtain a tour contract, contact the reservation desk at (409) 832-2134. The McFaddin-Ward House Museum is the perfect way to bring history to life. 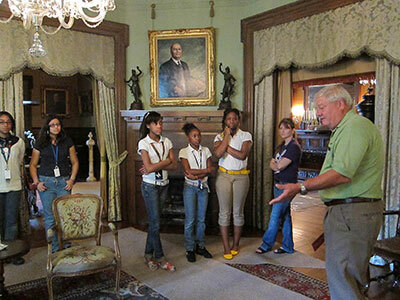 Students experience history through tours designed to connect with curriculum and a variety of educational levels. Hands-on activities may also be arranged, as well as a behind-the-scenes meeting with our curators. Tours are always free for students and must be scheduled at least six weeks in advance. Contact our reservation desk at (409) 832-2134 for details and reservations.